What are some of the milestones that we’ve hit so far in the construction? The major excavation is all done. The footings have been poured and placed. The basement walls are progressing, and nearly complete. What are some things that are going to be coming up in the next couple of weeks or months? In the next few weeks, the basement floor should be poured and they will be heavily into plumbing and electrical as the basement is fully prepared. Some time late in July, we will begin to see structural steel going up. That’s going to be over the course of the summer? The schedule calls for the basement to be pretty much closed up by the end of the summer. And then they move up from there. We’ll see most of the steel structure—pretty much the skeleton of the structure—by the end of the summer. Progress on the ECE new building, as of May 2012. I know that there was going to be some movement of a sewer line when they first excavated? Any surprises there? They’re doing a lot of utility work. There were only a few very minor surprises underground. Some of the lines were two or three feet off where they expected them. It didn’t turn out to be that big a deal in the end in terms of how they were handled. In a few places, the soil was weak, but this was a question of digging out some extra and backfilling with rock. 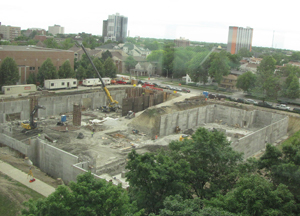 There’s a planned tunnel between this new building and the Beckman Institute. Is that project going to begin soon? It’s not clear when that excavation will begin. There will be a tunnel to Beckman. It is in the plans. It may be that they’ll be digging for that later in the summer. They certainly won’t fill in everything before they start doing that. In terms of the schedule, are they ahead of schedule or on schedule? I know they’ve had several very warm days during the early part of this year. They will always tell you they’re behind. In general, there are some things they are a little ahead on, there are some things they’re a little behind on. But I think that they said that there’s no global slippage at this point. They may be able to take advantage of the time to do a bit of shift work or use extra crews at some point. Flexibility is actually going pretty well, and the target completion dates are holding up. It’s coming along per plan. No significant issues or surprises as yet. It looks great. The team is enthusiastic. We haven’t encountered any significant issues. It’s an interesting project.